Type A personality, adrenaline junkie, calm in a crisis yet high performer under pressure, adept at multitasking, an ability to stay awake 24/7, survives on a diet of red bull and coffee. The poem was written by one of my colleagues. He’s not particularly a ‘type A’ person, or an adrenaline junkie for that matter. He IS an excellent trainee though, who lost confidence in his own abilities after being continually told that he didn’t have the ‘right kind of personality’ to be an ED doctor. 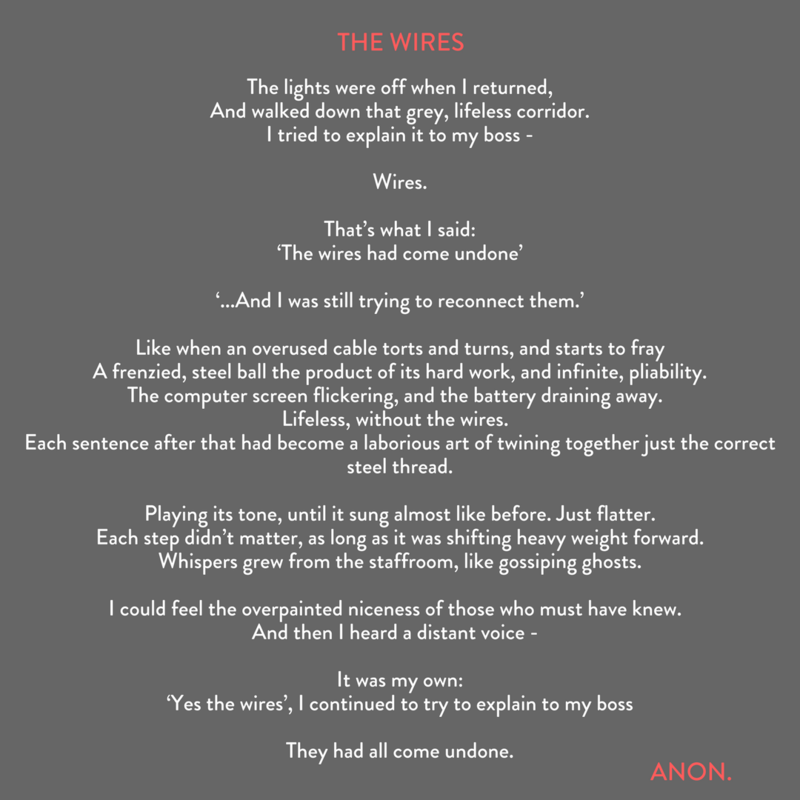 The unraveling of confidence, or ‘wires’ as beautifully described in his poem, happens to us all from time to time. Our hard “I can cope with anything” exterior, crumbling away after a complaint from a colleague, a missed diagnosis. the death of a child in our care. We are not superhuman, we are just normal folk, with an incredibly hard job to do. Keeping up the superhero act long term can be pretty draining. So what can we do to keep ourselves well, and our team motivated, enthusiastic and supported through the tough times? Here are some of our suggestions, and we look forward to hearing yours too. Look after yourself first. There’s a reason why the safety brief on a plane informs us to put on our own oxygen before helping others. We are useless to others if we are not well ourselves, and with a constant flow of patients fighting to get thought the door requiring our full attention, we need to be on top form. So put down the red bull and big mac, fill up your water bottle, get your flu jab, and have a well earned lie in. Set aside time to enjoy yourself. Who has time for that? It can be so hard to make time for your family and friends whilst combining a brutal ED rota and exam study. We’re all guilty of not making time for relaxing (says the girl sat writing a blog on her day off), but lately I’ve found that re-engaging with those hobbies I once enjoyed and had forgotten about, has provided relaxation and enjoyment, and allowed me to switch off from work. Sometimes, we just need to postpone the unimportant things – read our time management blog for some further ideas. We live in a time when social media is all encompassing. It is the way we communicate and learn. But having our phone constantly popping up with twitter, work whatsapp messages and facebook can make us feel like we are constantly at work, and doesn’t allow us to get away. Again, I should practice what I preach, but turning off twitter and whatsapp notifications when you are not at work can improve your work life balance. Fighting the lurgy can be a constant battle while working in an ED. The harder the rota, the more sickness there will usually be. Tired, stressed, worn out doctors get sick. Not just mentally burned out but physically ill as well. Our immune systems need to be on their A- game to fight off all those cold, flu and gastro-enteritis viruses we come across. Make sure you’ve had your flu jab first of all. Even a little bit of exercise in between those runs of nightshifts can boost your immune system and help to keep you well. Put good fuel in your mouth. Ready meals and coffee are not going to help you fight off the nasties, no matter how easy they seem when faced with a weekend of nights. Work is so much more enjoyable if there is a good team atmosphere. Even the hardest of days can be a positive experience if you feel like the team has got your back, and everyone is in it together. Debriefing difficult cases as a team is essential to maintain performance and help the team to process stress. Be nice to your colleagues. Help out the overworked nursing staff by dipping your own urine samples and putting a gown on a patient once in a while. In turn you will find that the favour will be repaid, with a smile. We are all in it for the same reason. Medics have always been terrible at telling staff they’ve done a good job. Instead, we can go through entire rotations without knowing how we are performing. Feedback, especially positive feedback does wonders for improving department wellbeing and morale. Being told you did a great job with that difficult patient, or delivered a good teaching session, can boost your mood for days! It makes you want to give more, do more, perform better. Hearsay suggests that one minute spent recognising behaviour, results in 100 hours of initiative in return. There are several ways in which we can achieve this, but the excellence reporting schemes such as GREATIX-ix, as introduced by EM3 and now used by many departments, are a great way of recognizing staff hard work and achievement, no matter how small. I have been surprised that even the most cynical of staff have a spring in their step after receiving one. Remember to recognize the whole team, including the reception staff, porters, and visiting specialties. They often feel isolated from the ED team, and it can improve team function and wellbeing to recognize their hard work too. Even with the best will in the world, occasionally for someone, the wires will come undone. We need to be there to offer support when this happens. Educational supervisors are the usual first point of contact, but having a separate mentor who you get one well with, doesn’t have any educational or deanery role, can be friendlier. Meeting for coffee outside of work to chat over any issues and offer support might seem safer than being called in for a ‘work meeting’. Talking about things with work colleagues might seem just too much, in which case, having a department folder of information with where to access help and support in times of distress is a good idea. There’s some resources on the RCEM Website about the concept of the “ED SPA“, this is a new idea produced by a trainee in Manchester, Laura Howard, who has done a fair bit of research on ED staff wellbeing. It’s normal to get fed up from time to time, after all “winter is coming” and “yes it’s going to be busy”. Take time to notice the little things- like the toddler you’ve made smile, or the new found confidence of the junior you’ve taught to do arterial lines. Report some positive events – reporting is just as rewarding as being reported. Remember what you love about the job- despite the long hours and the challenging patients, we get to make a positive difference to other people’s lives everyday, and not many people can say that! And just remember to take another sip of water. I think as the pressures grow on all of our departments we must all take time to relax and de-stress. I for lent have switched off facebook but know my biggest challenge is saying no to work related things on days off.